A big number of websites is live on the internet. They are hosted and managed by web servers located throughout the world. DNS means Domain Name System, the largest digital Internet database in the world. This database contains information about all the websites of the world. Each website and each Internet machine has an IP address, which is a numeric address. The domain name of the website is stored in this database along with its IP address. The data file that tells the web server how to respond to the search browser's request is called the DNS record. In computer terminology, a DNS record is called a "mapping file." When the web server sends a request to the user to access a particular website, the request will be sent to the DNS database. The database examines your records, finds the IP address of the website and passes it to the server's request. After obtaining this information, the server requests to use the IP address to find the website and show it to the user who initiated the request. The letters associated with DNS records are called DNS syntax. Some common syntaxes in all DNS records are: A, AAAA, CNAME, MX, PTR, NS, SOA, SRV, TXT and NAPTR. The syntax "A" in the DNS records is the most basic type of syntax. It represents the "address" and indicates the IP address of the website. The "AAAA" record is the IPV6 address, which sends the host name to the 128-bit IPV6 address. "CNAME" means "name" used to associate a subdomain with an existing DNS record. "MX" means mail exchange and is used for mail exchange servers. The "PTR" record in the name represents the pointer record and shows the IPV4 address in the CNAME. The "NS" record indicates "name server", which indicates the server where the domain is located. The "SOA" record stores important domain information because it was last updated, and so on. The "SRV" record indicates what TCP is running the domain. The "TXT" record allows the webmaster to insert any text in the record. Why do you need to look at DNS records? Why is it important to find DNS records? The DNS records contain important information about webmasters and SEO such as information about any website that you are interested in visitng. 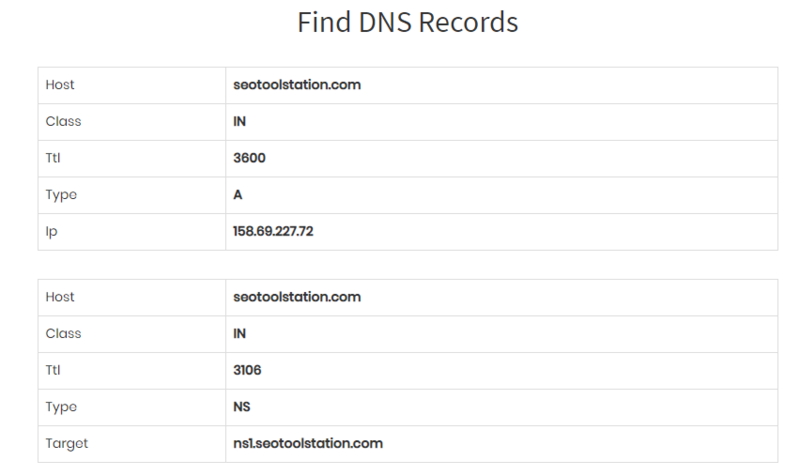 You can obtain IP domain adress information by looking at the domain's DNS records. The IP address will tell you which address is hosted, and if you know the structure of the IP address, you will know where to host the country from the domain. Assign an IP address, such as a phone number. IP addresses are assigned according to a specific structure. How to find DNS records? You need to use the SEO tool to extract and display these comments for you to find DNS records of your domain. Just go to our page by using the link freeseosolutions.com from the search engine and scroll down the icon until you find the icon "Search DNS record" and click on it. Alternatively, you can go directly to the tool by copying / pasting smallseotools.com/find-dns-records into the search engine. After entering the website in Free Online Find DNS records | whatsmydns, enter the domain name of the DNS registration website you wish to register. Press "Send" and it will return the domain's DNS record after a few seconds. Here you can see all the DNS records of the domain. Now you can see the notes and see the IP addresses listed in the type list "A". The list also contains records for "NS", "SOA", "MX" and "TXT".